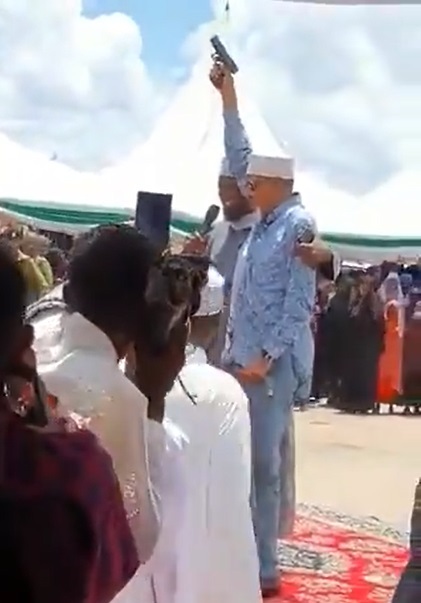 Wednesday April 17, 2019 - Garissa Senator, Yusuf Haji, is currently the talk of the town after he was caught on camera firing a semi-automatic pistol in the air in a wedding ceremony in Garissa Town. During the wedding ceremony, Haji fired his pistol four times in the air after being invited to address the guests. As Haji, who is the father of the Director of Public Prosecution (DPP) Noordin Haji, fires his pistol, some of the guests at the ceremony are seen cringing while others are heard cheering. Is Interior Cabinet Secretary, Fred Matiangi, aware of this incident or is he just ignoring it like other hyenas in Jubilee administration? A Somali elder, who requested anonymity said shooting in the air is part of Islamic wedding ceremonies borrowed from Arabs.